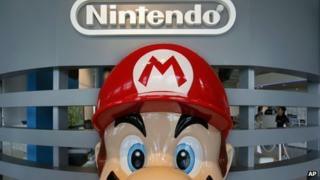 Nintendo will continue to focus on its hardware and software platforms and will not release its games on smartphones. The company's president Satoru Iwata said he remained committed to video game consoles despite disappointing sales of the Wii U. The comments came after the makers of the Super Mario games revealed a drop in profits. Plans for a new health business were also announced. Mr Iwata was speaking at a business briefing where he was outlining the company's future plans. "Lots of people have said we should go onto smartphones over the last few years, telling us our business would increase. But our approach is not to put our games on smartphones," he said. He did say that the company would license character rights to other firms and that mobiles had a place in helping customers "understand the wonder of Nintendo games". The Wii U was launched during November 2012, with Nintendo attempting to recreate the success of its original Wii console. Shigeru Miyamoto, Nintendo's game creator, responded to criticism about the lack of titles for the Wii U and said that there was a big technological leap from Wii to Wii U. "Not that we're trying to give excuses," he said. Spencer Izard, an analyst with IDC Insights, thinks Nintendo is facing challenges from the disappointing sales performance of the Wii U and by not adopting mobiles. "With the continued adoption of smartphones as gaming platforms in the mobile space I believe that Nintendo will see a further erosion of their market position in this space. "The Wii U should be frankly considered as a failed platform now due to much stiffer competition from Sony and Microsoft." It was announced that Mario Cart 8 would be launched in May and that Nintendo DS titles would be streamed to the Wii U GamePad through its Virtual Console service. The boss said the future focus of the company was "enhancing the quality of life through entertainment". He said the key area was "health" but Nintendo would not be entering the wearable tech market. Instead it would focus on trying out a new "non-wearable way to monitor health". There were few details revealed but Mr Iwata said more would be unveiled later in the year and there would be a launch date of 2016. The company's shares fell 4.3% after the briefing. Mr Iwata acknowledged that Nintendo had a lot of work to do if its fortunes were to improve. "This was the worst year-end shopping season since I became president. We need to rebuild as soon as possible," he said. What next after poor Nintendo sales?